We’re excited to announce that we’re updating to Samsung Account! 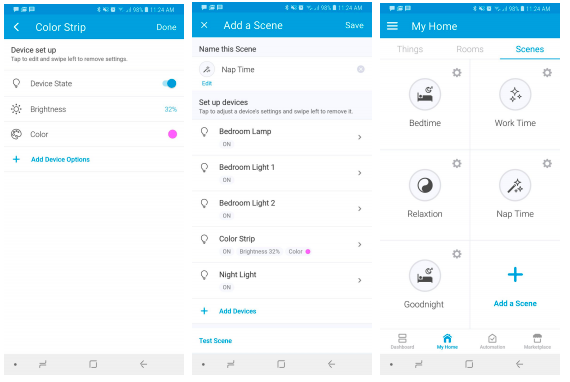 This is a step forward in our journey to prepare you for the new SmartThings app, which will bring you access to hundreds of Samsung devices and services in addition to all of the Works with SmartThings products you already use and love. It’s easy to update your account in the SmartThings Classic app. When you see a banner with an account update notice, just follow this guide or follow the prompts within the app to update your login. Don’t see it quite yet? The account changes are being released in small groups to ensure the best possible experience so not all users will see the update at the same time, but expect it to pop-up soon. The process may take a few minutes to complete and during this time, you won’t be able to use SmartThings Classic. After you complete the process, you will be logged out of the SmartThings Classic app on all other devices. 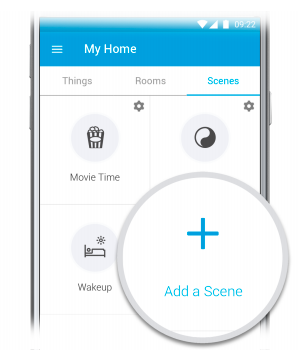 Going forward, you will use your Samsung account to access the SmartThings Classic app. Don’t have a Samsung account? No problem. You will be able to create one when you update your login. Already have a Samsung account? Great! Use those credentials when you update your login. Once you’ve updated your login account, please continue to use the SmartThings Classic app until you receive additional communications from us. We’ll be back in touch when the next steps are ready, and we’ll give you plenty of time with each step to transition to the new SmartThings app, which we can’t wait to share soon. Still have questions? Check out our FAQs or get in touch with our support team here. 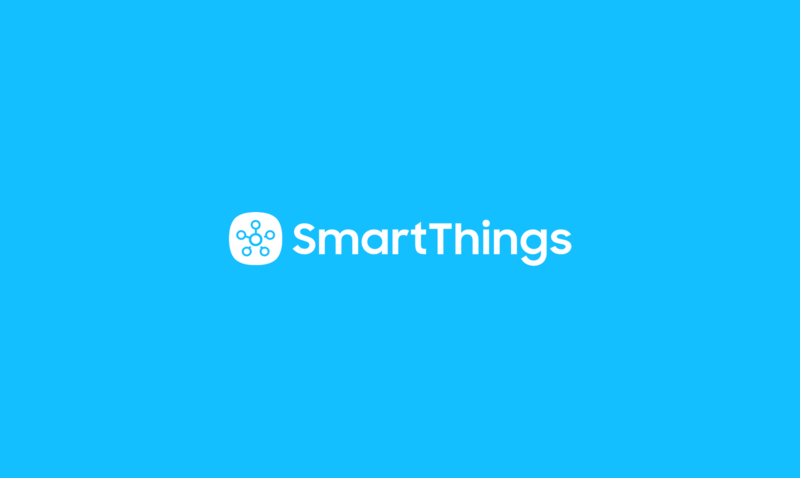 Yesterday around 12:30 PM PT, SmartThings began experiencing capacity issues with the SmartThings cloud, which led to an outage that impacted US users’ ability to log in to the SmartThings mobile apps and control devices. These issues intermittently persisted until 9:16 PM PT, at which time the root cause of the outage was addressed, and users were able to access the SmartThings apps and control networked devices. Issues persisted for a small subset of those users, specifically related to installing and editing automations until just after 8:00 AM PT this morning. Since that time, all US operations are performing as expected and we continue to closely monitor our systems. It is our continued goal to provide our users with the best and easiest solution for their smart homes. 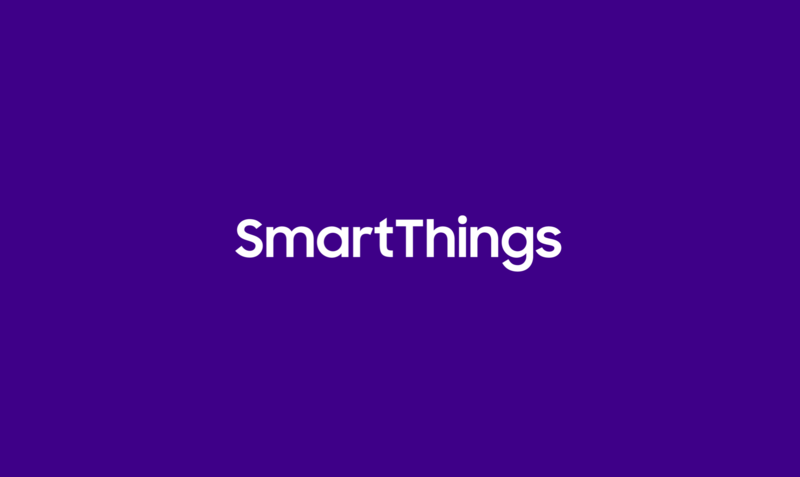 Anyone who is experiencing an issue or would like to get in touch with our team can reach out to us at https://support.smartthings.com. We’re delighted to announce that a brand new SmartThings app is here. 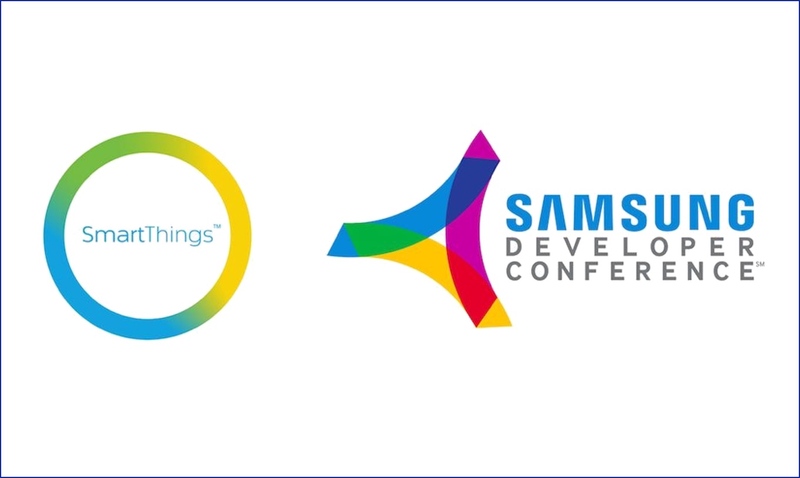 As announced at CES, Samsung is uniting all of its IoT applications in Spring 2018, including Samsung Connect, Smart Home, Smart View and more, into the SmartThings app. This will make it even easier to connect and control hundreds of devices directly by phone, TV, or car – all from a single application. 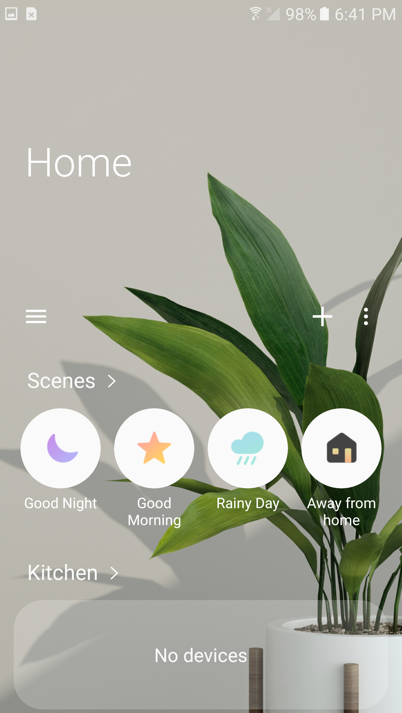 The new SmartThings app is our first step towards making this happen, and brings simplicity and connectivity to a wider range of smart devices so our users can easily and securely control their homes, and is available to download now from the Google Play and Apple App Stores. We are working to ensure a smooth transition for our existing users, and to make the process as painless as we can, we’ve renamed the current app our users use (and will still see in their phones) to SmartThings Classic. 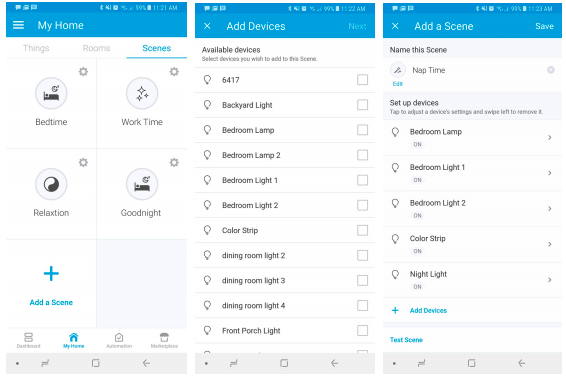 If you are a new SmartThings user, you will be directed to download the new “SmartThings” app to begin to monitor, control, and automate your home from anywhere in the world, and begin to add as many connected lights, locks, sensors, and devices as suits your unique personality and lifestyle. When you’re driving away from home, it’s easy to worry if you’ve locked the front door or remembered to close the garage door. 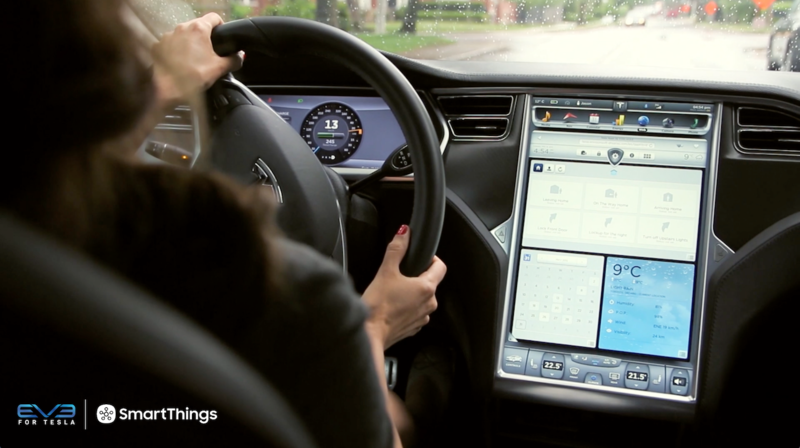 So we at SmartThings are excited to announce that we’ve partnered with Evolved Vehicle Environments (EVE) and their EVE for Tesla solution EVEConnect, the most advanced connected home and connected car integration solution, to bring a new community of users peace of mind from anywhere. Integrating the smart home and the connected vehicle so you can monitor and control your home even when you’re on-the-go, this partnership gives unprecedented continuity as you move throughout your day. Now, Tesla drivers can access, update, and receive real-time information about their smart home products, all from the front seat. For example, a driver leaving their home could turn off the lights in their living room or lock the back door all through SmartThings. So you will not only know the status of your home devices, but also be able to adjust anything you may have missed without adding time to your commute. Ergonomically designed for safe and effective in-car usage, EVEConnect provides seamless connectivity, while reducing driver distraction. Real-time home information and alerts of unexpected activity are continuously updated and clearly displayed on the dash, removing the problem of connectivity “downtime”. As we continue to broaden the SmartThings experience, we look forward to finding new and better ways to make it easy to control all of your ‘things,’ and are excited to continue to expand the limits of the smart home. At Samsung SmartThings, we strive to offer our users the most choices when it comes to their home devices, whether it’s partnering with new products and partners – or finding new ways to control, automate and monitor your home. So continuing this commitment, we’re excited to announce our newest partnership with ADT – and the launch of a new professionally monitored, self-installed security and life safety solution powered by the SmartThings platform – all backed by ADT professional monitoring with no long-term contract necessary. Consisting of a Home Security Starter Kit and Home Safety Expansion Pack, the new solution from Samsung and ADT gives anyone the ability to grow their connected home ecosystem as their needs evolve. The products will be available for pre-sale on www.bestbuy.com and www.Samsung.com today, and available in Best Buy stores on October 29. 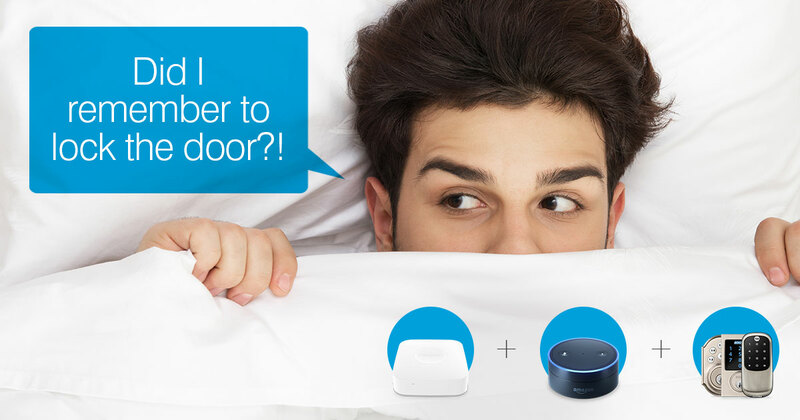 With the intelligence and connectivity of Samsung and the unmatched professional monitoring of ADT, the Samsung SmartThings ADT home security system is a customizable, DIY security solution that connects with hundreds of compatible SmartThings devices to allow for one central control point. The basis for the new DIY system is the Home Security Starter Kit, which includes the Security Hub, two Door and Window Detectors, and one Motion Detector. The system size can be expanded with additional detectors and alarms as needed, including fire, carbon monoxide and water leak detection with the addition of the Home Safety Expansion Pack. The ADT Security Hub touchscreen panel, used to arm and disarm your home, also has a built in SmartThings Hub. 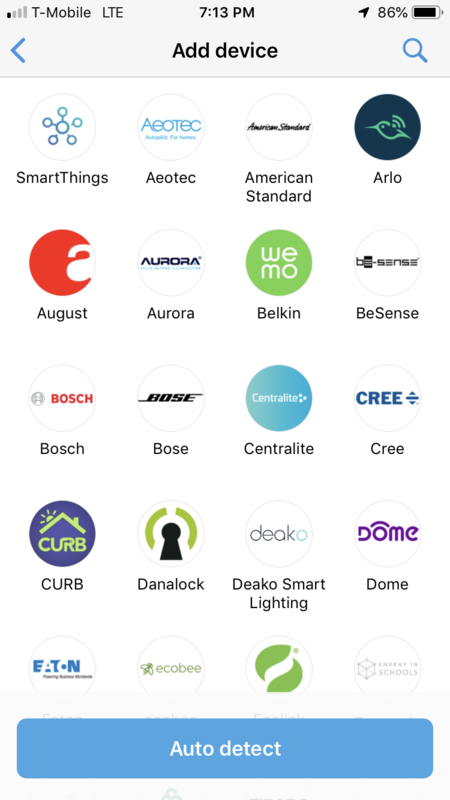 This allows users to add and control their favorite smart home devices, like lights, cameras, doorbells, door locks, thermostats, sensors, voice assistants, and more within the SmartThings App as they expand their smart home. From the Android- and iOS-compatible SmartThings mobile app, consumers can easily manage these devices and sensors, set up routines, and receive alerts based on their preferences, as well as check on the security of their home. Innovating with purpose is at the core of how we develop our products and choose our partners, and finding new ways to make your home smarter, easier is our goal. As we continue to find new ways to make controlling your home effortless, we’re excited to roll out more service offerings like these – that bring together the best devices in the world, all in one app – without cluttering your home with extra products and complicated contracts. In Q1 2018, customers will be able to add a unique video solution to their Samsung SmartThings ADT home security system. The new solution will combine custom camera hardware, cloud video storage and exclusive on-demand safety options, all seamlessly managed in the SmartThings mobile app. Connect, protect, and enjoy a smarter peace of mind.